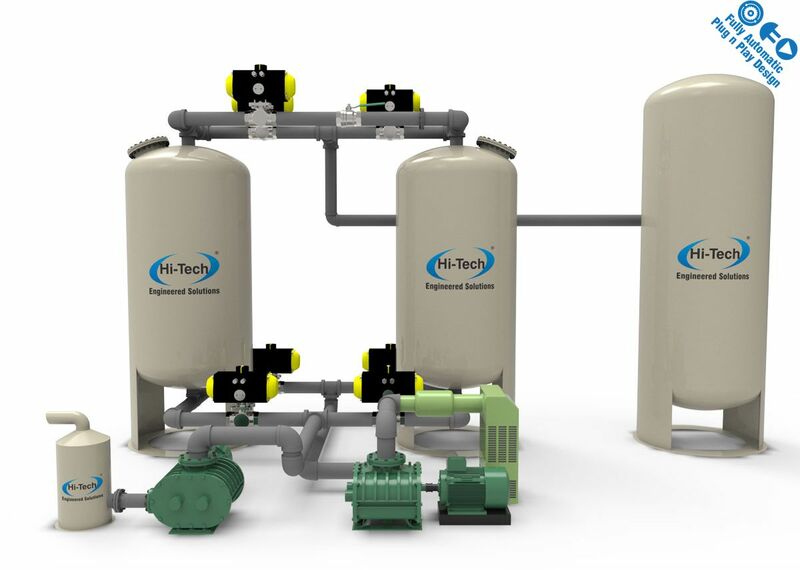 The Hi-Tech’s VPSA Technology Based Oxygen Generation Plants Are designed for on-stream application with need for low-cost oxygen with a purity of around ~90% to 94% V/V and balance gas consisting of Nitrogen and argon,where it is not economical to produce the required oxygen with on-site cryogenic units or take it from Cryogenic liquid oxygen storage Tanks/Systems. The VPSA oxygen plants are providing low-cost oxygen with a reliable and trouble-free process the capacities of the oxygen plants range from small plants requirements of only several Nm³/hr up to large-scale plants with several Nm³/hr oxygen products flows. Cost saving in the range of 40-60% over liquid supply Systems and up-to 80% for Cryogenic Plant. The VPSA system provides the highest reliability the control system allows for the production of oxygen at the specified flow & purity within a short time of demand using a simple push button. this on/off operating capability is not available from cryogenic plants. Lower energy consumption than cryogenic units. PLC-based control system controls the purity and the flow by automatically adjusting the cycle time of the VPSA system. A Profinet or LAN port is provided for the communication with complete Plant Directional Control System with optional Modem Board for Remote Control. Containerized Shipments right from factory. Automatic turndown capability from 100% to 0% flow capacity. Oxygen VPSA Plants supplied by Hi-Tech Engineered Solutions range in the size of a few 50 Nm3/hr up to 600 Nm3/hr with an oxygen product purity of ranging from 90% ~ 95% V/V. For many Processes using oxygen rather than air reduces vent gas quantities and reduces energy and capital cost requirements. Furnaces in lead, copper and zinc industry. Chemical leaching for minerals extraction. Chemical oxidation reaction using oxygen reduces.vent gas quantities and hence energy and capital cost. Furnace enrichment oxygen burners have a much more intense flame, So the heat transfer is greater & furnace can be smaller and less fuel is consumed. Our VPSA System from 79 to 526 NM³/hr of oxygen.Use the following table to determine which model is most suitable to your application. Oxygen Outlet pressure at maximum plant capacity.